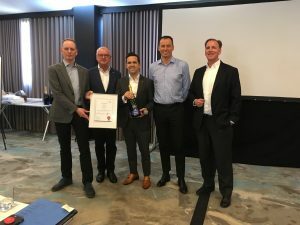 Roto North America has received the “2018 Customer Value Champion” award from Roto Frank AG, presented by Dr. Eckhard Keill, Roto Frank’s global CEO. Roto North America was honored to receive this award at the January Roto Group Leadership Conference held in Lisbon, Portugal. The Customer Value Champion award measures the long term performance and development of a company in the marketplace based on an independently performed customer value analysis. This is the fourth time that Roto North America has received commendation in the last six years, as it was the recipient of the “Customer Value Champion” in 2017, “Best Performing Market” award in January 2016 and the “Turnaround Performance Award” in February 2012, among other accolades. Roto North America prides itself on providing superior customer value.